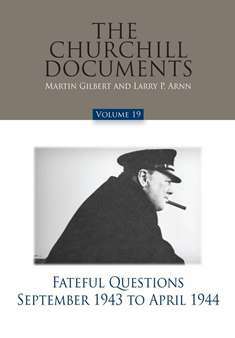 FATEFUL QUESTIONS: SEPTEMBER 1943 - APRIL 1944 - by Sir Martin Gilbert and Larry P. Arnn. Hardcover, 2728 pages. This volume relates Churchill's story from the invasion of mainland Italy to the final preparations for Operation Overlord. During these eight months, Churchill traveled nearly 14,000 miles, wrote more than 1,800 pieces of correspondence, and delivered over a dozen speeches. As the tide of the war turned in favor of the Allies, Churchill focused his attention and energy on matters such as the Italian campaign and its early stagnation, the three major Allied conferences at the end of 1943, the bombing campaign executed by the British and Americans against the German homeland, and the desperate need for landing craft to deploy in the impending cross-Channel invasion. Churchill Centre members receive a 15% discount = $51.00 each). Regular price = $60.00 each/Series of 22=20% discount @ $48.00 each / Bio. set + Doc. set = 30% discount @ $42.00 each. (The discount will not appear on your confirmation, but will be given to you at the time your order is processed)! Shipping via media mail, through Hillsdale College Press; rates calculated when order is shipped. (Additional rates for International orders).